Are You Ready for Thursday? Grab the chocolate! Chocolate chips, that is. And your favorite chocolate chip cookies recipe and a few cute kiddos. It is time to celebrate National Chocolate Chip Cookie Day!! Thursday, May 15th is the day set aside to enjoy this delicious yumminess. What is a mom to do? While we are mixing up that cookie dough, we can mix up some fun and yummy learning, too. I’m not sure about your kiddos but I know mine might get a little more excited about math if it includes chocolate chip cookies and a nice cold glass of milk. 1- Make a batch of cookies and deliver to your neighbor or a friend who needs a smile. 2 – Read If You Give a Mouse a Cookie by Laura Numeroff with your little ones. 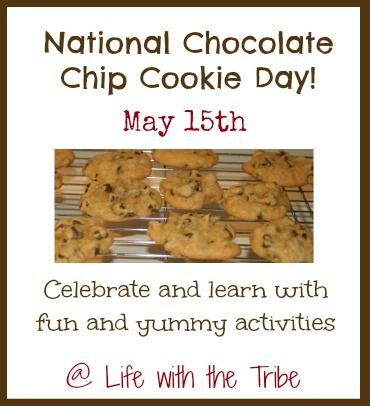 Then head over to my Pinterest board: Chocolate Chip Cookie Day for some fun printables and activities. 3- Invite friends over and have a chocolate chip cookie baking party. 4- Host a chocolate chip cookie baking contest. I’m sure there will be plenty of volunteers to judge. 5- Do a bit of geography and locate the places the ingredients for the chocolate chip cookies come from. 6- Pour chocolate chips into a jar. Let your children guess or estimate how many chips are in the jar. Have an official count and the winner receives a giant chocolate chip cookie made especially for them! 7 – Do some experimenting! What other yummy additions can you put in your cookies to partner with the chips? Sprinkles? Peanut butter chips? M&Ms? No raisins! 8 – Make chocolate chip cookie ice cream sandwiches to enjoy as a cool treat. 9- Have a scavenger hunt. Write clues on cookie cut outs and hide them. The scavenger hunt ends with a cookie celebration. Yum! 10- Get the creative juices flowing and have everyone write a story that includes chocolate chip cookies. Why not munch on a cookie while writing? I need to make sure we have plenty of chocolate chips for Thursday! I can’t wait. If you enjoy cookies on Thursday, please share the fun and leave a comment! This entry was posted in Homeschool, In the Kitchen, Something to Share, That's Life and tagged chocolate, family, fellowship, Homeschool, kitchen, math, preschool, smiles by sweetie. Bookmark the permalink.